The Fed left interest rates unchanged during its June FOMC meeting, exactly as we previewed and exactly as the markets expected. The June statement itself did not shed much new light that market participants hadn't already known. It was when Fed Chair Yellen (or what we referred to as a badass troll in our last Snippet) started speaking in the post-statement press conference, that really roiled the markets. That said, this is the second biggest event risk gone for the incredibly busy month of June, but it didn't happen without occasion. "We're just 4 minutes before the release of the June FOMC statement and interest rate decision, so we present this chart plotting the VIX (S&P 500 implied vol) against its underlying market. Here you can see that the SPX is trading very rich to where the VIX implies it should. Put another way, implied volatility is much higher than where it usually should be trading given the price action of stocks. This could be a dislocation, or a sign of massive demand for protection as hedgers bid up downside protection via short term VIX calls. There might also be speculative interest as traders bet that stocks will see more downside and are levering up on inverse-risk plays. We shall see in a few minutes time of the VIX is right." If you haven't already, we highly encourage you to read through our past articles published on our Snippets Journal as they provide the all important context for understand what we're about to covey in this piece. In short, the Fed is confused, has lost a lot of confidence, and is infusing more uncertainity amongst traders and investors than ever before. When the U.S. economy was actually primed and ready for a rate hike at the start of 2015, the Fed procrastinated and deliberated for almost 12 month before raising rates in December. As the economy and financial markets started to realize and react to a very delayed hike, financial conditions started to deteriorated much faster than the Fed had envisaged. This swayed the opinions within the FOMC itself, which translated into no new monetary policy actions YTD, only a lot of confusing rhetoric. By not committing to its initial path of tightening (when rates first lifted off in December), the Fed has placed itself in a very tough position. The longer it waits and observes, the more perplexing the entire landscape of future rate increases becomes. As markets and the economy don't like uncertainty, this very fact negatively impacts sentiment and actual macro, making future rate hikes increasingly risky. Further, as we head into the second half of 2016, the Fed will find itself confronted with even more event risks that will most likely make it less conducive to tighten into (U.S. Presidential Elections being the biggest known event risk for 2H16). Waiting only increases the risk of the Fed conceding to committing a policy error, which will happen if and when the Fed lowered interest rates or significantly alters its guidance and language dovishly (something we saw to a slight extent in the latest June FOMC event). Waiting too long also heightens the likelihood that the current cycle gets 'frozen in time', creating high inertia in future decisions. This forms a feedback loop which we believe markets have already started to discount for. "As expected, the Fed left its target rate unchanged at 0.25-0.50% in June. Dollar knee jerks lower in the statement release. Markets are awaiting Yellen's presser and Q&A session in 30 minutes time." According to most analysts, commentators, and in some part the financial markets themselves, just about every aspect of the June FOMC event was more dovish than had been anticipated. It did however take some time for this realization to sink in; the realization that the Fed had nestled more closely with the doves, which is a sharp detour from what the April FOMC minutes had implied only a few weeks before. "Post the uneventful June FOMC meeting where the Fed kept rates unchanged as expected, markets are going berserk. 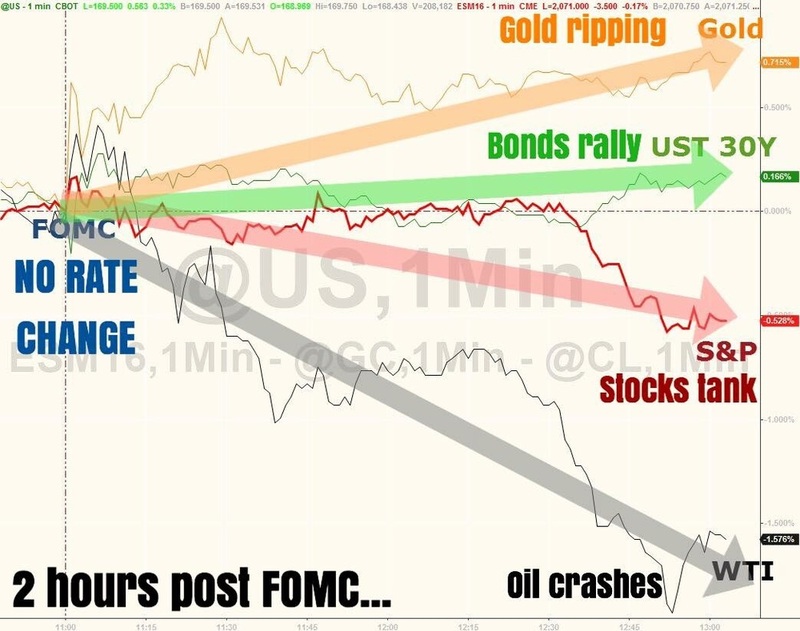 In short, the initial reaction has been broad based dollar weakness, strength in anti-dollar assets such as precious metals (gold, silver, ect...), bonds heavily bid as yields crash, and equities rather confused on their trajectory. FED MEDIAN 2016 GDP GROWTH FORECAST 2% VS 2.2% IN MARCH EST. More to come as we see it. Meanwhile, Yellen will start speaking in 2 minutes..."
First, there was no rate hike (duh). However also remember that market-implied June rate hike odds were once above 30% at their highs, only falling to 4% right before last Wednesday's event. Economic and inflation projections were either held constant or lowered across the board. Inflation was only projected to reach the Fed's long-term target by 2017/18. The all important "dot plot" shifted lower across all years. FOMC members only projected 1 rate hike for 2016 (down from 2 during April's plot). There was the entrance of a new "uber dove" who we now know was none other than James Bullard (a once very hawkish proponent for higher rates). The entire plot shifted lower by at least a notch; 2016 FF rate projections were lowered to between 0.6-0.75% (down from 0.75-0.9% in April). June's "dot plot" was the strongest indication of a dovish shift for us. Yellen's admission that she has no clue as to when the Fed will hike next. Yellen also said all upcoming FOMC meetings would be "live". The Chairwoman also admitted that jobs creation has certainly slowed, referencing to the huge disappointments in the April and May payroll reports, although she tried to pacify markets not to read too much into a single jobs report (we totally disagree that May's disasterous report was a one-off). "As you analyze the latest Fed "dot plot", Yellen is busy jawboning markets into a frenzy, doing what she does best: Baffling with bulls*** when things get tough. What she cannot jawbone over is the fact that FOMC members are now collectively more dovish than in March. Besides the emergence of an unknown uber dove, who so daringly affixed a 0.6% projected rate for both 2017 and 2018, most members have projected at least a notch lower, bringing 2016's (June FOMC) projected FF target rate to a median of 0.9% and a midpoint of 0.6%. The "dot-plot" curve is also more gentle as compared to in March (notice the green lines). Other than the Fed's own projections (which will most likely be moot come July and September), the market is still expecting the effective FF target rate to be significantly lower than what the Fed expects (see violet line). In fact, the OIS forward rate for 2017 is 0.6%, exactly that of the mysterious uber dove's projection! YELLEN: EVERY MEETING IS LIVE, CLD MAKE DECISION AT ANY MTG"
As we mentioned in the points above, FOMC members only saw 1 rate hike for the rest of the year. This essentially means that after its initial hike in December last year, the Fed expected to hike rates only once in 2016. That's right, the very same Fed that so brazenly said at the start of the year, that it was firmly on the path to normalizing interest rates as the economy improved, is now only going to hike rates once this year (assuming it even does). Talk about credibility. "The only, and perhaps the most direct chart you'll need to realize that the Fed has lost credibility. Tightening and acting all "hawkish" when its FOMC members have actually projected LOWER long-term rates since mid-2015 (when the rhetoric of a liftoff started to heat up in earnest, if you remembered). Regular followers will know how we have mocked at the Fed for its whimsical dexterity when it comes to decision making. We're not the only ones of course. Below, we present without alteration, the words and commentary of professionals in the industry. It bears reading. "I think the first rate hike cycle is over. What Janet Yellen said in response to my question, and if you look at what has happened to the rate hike cycle, is pretty profound. It's as close to the Fed getting to capitulation as I've ever seen, about the efficacy of Fed policy, about the outlook for the economy." "The 'rate hike cycle' has left the building. They are not preparing the markets for a rate hike at all. Yellen sounds like she doesn't have confidence anymore. She is backing away from any forecast. She is simply saying, 'I really don’t want to forecast anymore.' We are done with this forecasting game. The subtext is that 'we've been so wrong forecasting the data, we should stop'." "Chair Yellen made one thing clear today: there is unlimited uncertainty in the Fed’s forecast for the economy, inflation, and path of growth. Since 2012 the long-term median dot projection has plummeted from 4.25% to 3% with 50bp of reduction so far this year. In our view, it is no good to talk about rate hike projections in 2018 or beyond when there seems to be just as good a likelihood of secular stagnation or recession by then. Alternatively, if the goal is to increase inflation expectations, explicitly say that the FOMC will opportunistically reflate -as our economists expect is their real policy. The current rhetoric, in our opinion, is frankly too candid, showing little to no conviction and thereby creating little confidence in just the metrics the Fed wants to nudge higher. Though we don’t expect a recession in 2016 (that is neither our economists’ nor the High Yield strategy house view), we do think that the underappreciated risk is that the consumer begins to rein in spending as job security becomes more of an issue later this year. Additionally, we have already seen that the steady increase in negative yielding assets has done little to affect high yield over the last 6 weeks. And should oil fall and fear replace a search for yield mentality, we think outflows, ETF selling and profit taking is likely to ensue. As it relates to the Fed, in our opinion there is only downside. Hike and the market’s reaction to the substantial divergence of global central bank policy likely causes yields to go lower, uncertainty to increase and spreads to widen. Stay on hold and the reasons for not hiking (global uncertainty, low inflation, poor economic growth and weak corporate fundamentals) ultimately leaves risk assets vulnerable to shocks. In either environment we continue to recommend barbelling portfolios: high quality duration, preferably IG paper, fallen angels and new issues with lower quality issuers that have “already realized” their event." Trading a Fed hike has become a game of gambling..."
There 4 additional FOMC meetings left for 2016; July (no press conference), September, November (no press conference), and December. Fed Funds futures are implying the highest odds for a hike in July. July is also what the market is most focused on as the Fed isn't all that expected to hike in Septmeber as the U.S. Presidential Election will be in full swing then. Yellen however mentioned during her presser, that the Fed does not factor in the presidential race when deciding on monetary policy. Perhaps something too convenient and unwitting for a bluff? We think so. "Updated market reaction after no hike decision in June FOMC. In this case, it's obvious that dollar weakness doesn't equate to strength in risk as stocks are fading after spiking initially. USD containers to be weak while gold and bonds March strongly higher. FF futures implied rate hike odds for July and September both plunge as the market seems to view the June statement as more dovish than hawkish, with added elements of caution and apprehension by some FOMC members." Other than that, market-implied rate hike odds for all 4 upcoming FOMC meetings are now sharply lower. It's rather difficult to gauge with full accuracy what the market reactions were to the June FOMC event. This is primarily due to the large number of factors which have been driving risk flows (UK referendum being one of them). In the charts below, we have documented these reactions across various asset classes to our best abilities. Everything started to turn when Yellen opened her mouth. The U.S. dollar is now higher than where it was pre-FOMC. Believable? As we warned, Yellen is the biggest troll of all and she wants to get at us!" "The post June FOMC market madness is still ongoing. The U.S. dollar has been a volatile mess against other currencies, but a one way street lower against the precious metals complex (gold & silver the prime examples). Bond yields have crashed, with the 10-year UST yield back to its February lows (a period when risk aversion and flight to safety was at their climatic highs). The June FOMC statement provided little guidance as to when the Fed might hike again, citing that the labor market has certainly slowed down and markets should expect lower employment figures as the U.S. economy closes in on full employment. The inflation message was generally similar as April's, as the Fed projects long term inflation to reach 2% over the coming years. As we forewarned, the Fed (staring Yellen as the biggest troll of all) has once again fooled markets into making wild gambles on when it might next hike rates, directing the market's focus to macro as the Fed claims it will continue to be data dependent (even more so now given the extremely bad jobs reports of late). When Yellen said during her presser that every upcoming FOMC meeting would be a "live" on from now on, and that the Fed can hike at any given moment, we knew that the ongoing crappy chop in the markets will likely persist. Good luck try to ride this out folks!" As such, we continue to expect volatile and trendless market conditions with bonds and precious metals outperforming equities. The USD will likely continue to trade in a big range, and should be expected to stage false breakouts in either direction. Until the Fed actually acts materially, we are most likely to maintain this stance.